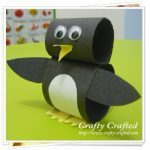 Create this cute arctic styrofoam cup penguin with the simplest of materials. You might want to also make a little scarf to help him to stay warm! To begin take your styrofoam cups and put one on top of the other so the tops are facing. Tape them together. This will be your penguin's body. Next cut out two penguin wings from your black construction paper. They are the shape of pointed tear drops. Use the picture as a guide. Glue or tape them to the sides of your penguin's body. Next cut out a bright yellow triangle for a mouth and two bright yellow webbed feet. Tape or glue the feet to the bottom of the bootom cup so they stick out. Glue the penguin's mouth onto the front of the cup. 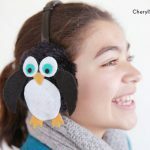 Next cut out black and white construction paper eyes and glue them onto your penguin. Now decorate further if you wish! Add cotton ball fur with glue, crayon features, feathers, a tissue paper scarf. You decide! Enjoy Crafting! This craft reprinted courtesy of thebestkidsbooksite.com. This site contains suggested reading material and crafts to help young readers relate to the stories.